» The Ideas Box now in Detroit ! 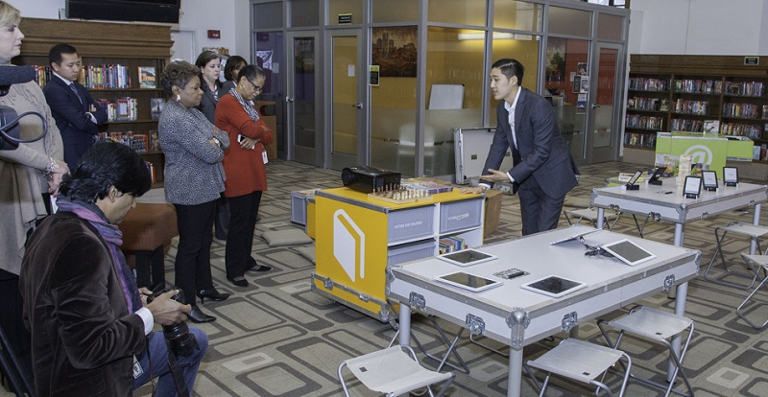 On Monday, November 30th, Libraries Without Borders and officials of the Detroit Mayor’s Office and the Detroit Public Library network officially launched a project enabling access to the Ideas Box and its ressources for local communities, including during the holiday season. Lasting through the month of December, the Ideas Box will move around the city and reinforce the public library network’s presence and service in different neighborhoods. The project is backed by the Detroit Mayor’s Office and the Detroit Public Libraries, as well as the Knight Foundation Fund of the Community Foundation, the United Way for Southeastern Michigan, the Detroit Public Library and Southwest Solutions. The Ideas Box is a portable multi-media center program by Bibliothèques Sans Frontières / Libraries Without Borders and it is currently being implemented in countries such as Burundi, Australia, Ethiopia, Jordan, Lebanon and France. For more information check out the Daily Detroit’s article on the launch.